The original electric motor for player pianos all had two windings and a centrifugal switch which normally started the motor by connecting the high-current start winding parallel with the run winding. Both windings were inductance windings and there was no commutator or brushes to the armature. The start winding however was the shorter high current winding and switched out very quickly, within one rotation or so if there wasn't a high load on startup, just to provide an initial impulse to the shaft to get it up to speed. If the motor had a heavy load start, it could burn out the start winding. The voltage on the early motor plate was either 110 or 115 vac, which is the voltage the motors were tested at. But in the early days, it was more common to have low voltage in some places. For the old motors however, this was less likely to burn them out as our modern motors would do, since their hp was rated by a pony brake test which pulled it down to 85% of its rated rpm. Today, electric motors of the residential variety have their hp rated at stall. So when you see a 1/8th hp or a 1/10th hp (as you find in these old motors), it is equivalent to roughly a 1/4 hp motor, today. Low voltage to a motor is what heats it up, rather than high voltage (of course, this is to a degree). The reason for this is basically a motor's back emf, which tends to draw current from the ac supply exponentially when working under its rated load. It's the motor's nature to seek equilibrium at its design rpm. As a load is increased, it's current increases by the square. When that happens, temperature rises, the resistance of both the copper wire and the field path of the iron increases, also exponentially, and the temperature and current both cascade, creating an extremely hot motor. High heat in turn eventually destroys the lubrication and even after normal voltages are restored, that motor will tend to run hotter unless it is removed, disassembled, cleaned, and lubricated. a fire! So during loud passages, if you hear the motor clicking, that's the centrifugal start switch continually requiring the start winding and a real danger sign! This is a device utilized by almost all player pianos and automatic instruments. 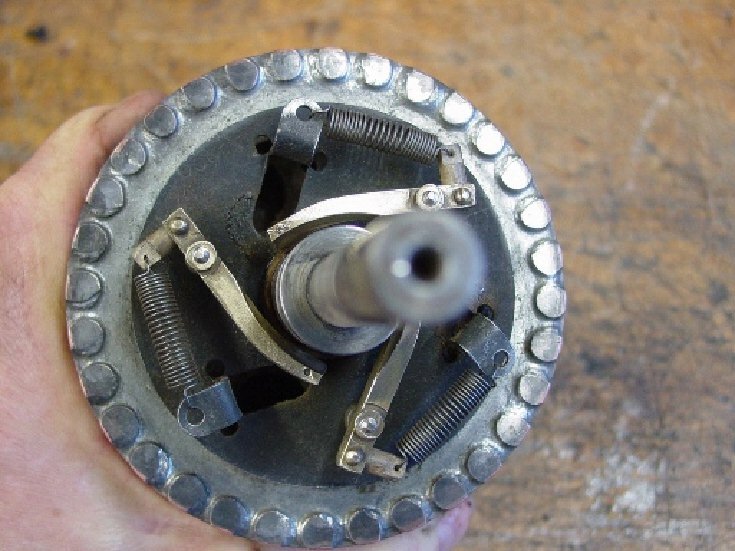 Incorporated into the motor case, it consisted of a set of slip rings mounted onto the front shell inside the motor, and centrifugal contacts connecting the two rings, mounted on the rotor armature. The three contacts were just shorted together on a common plate. The slip rings were paired, so that there would always be a connection between the two. This completed the circuit to the start winding, which was paralleled to the run winding. In old motors, especially ones which have been eagerly over-oiled, there was a heavy oily residue thrown around inside the motor case. This constitutes a dangerous situation in the case of start winding switches, which spark powerfully when opening up, due to the back emf of the coil. If the oil and dirt is coated heavily enough or someone has used WD-40 to soak the interior of the motor, this residue can migrate close enough to the slip rings to ignite. rings again when the front shell is replaced. shows stationary slip ring pair. When these motors are serviced however, it is very unlikely that they will ever give any problems. Cleaning brass contacts is very straightforward but not "simple." Sometimes both a strong solvent, plus hydrochloric acid must be used, and then thoroughly cleaned out of all the crevices with ammonia and water, blown out, and dried in a low heat, just to be safe. The Slip rings in different motors are quite different, also. Holtzer-Cabot was about the most rugged design of all, though. In slip rings in which they were just riveted to a sheet of phenolic, you have to be careful because they tended to get bent and make poor or intermittent contact. 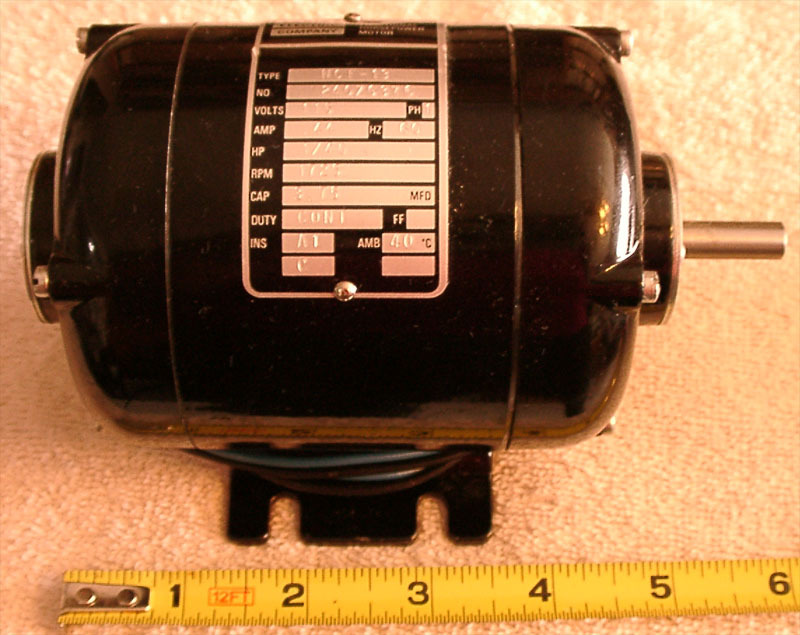 The Ampico however had a pump spill system, a smaller pump capacity, and also a smaller motor pulley for a slower-running vacuum pump that inherently makes it a safer system in this regard, even though the Duo-Art motor was a bit larger (.2 hp difference) to compensate for that difference, it wasn't nearly large enough to overcome a dead-headed closed positive-displacement vacuum pump without any slippage. These piano motors had a feature not found in practically any new motor, today-they did not have ball bearings, but sleeve bushings. These were bronze bushings, and when the armatures were first installed, a workman would use bluing and a three-cornered sharp tool to hand-shave the bushings true, after having pressed the sleeves into the motor shells, which very slightly compressed the bushings. This was called lapping. The reason is simple. They needed an electric motor that didn't make any rumbling sounds like ball bearings make. Today, when a new motor is used to replace a missing old motor, they are considerably more noisy. Another factor is the mass of a new motor, which seems to be less by half. The lighter a motor is, using the same current, the more noisy it's going to be, having much less iron in its field poles. This means the hysteresis factor/joule is going to be much higher due to magnetic field saturation-loss. The old motors were wound with cotton-covered copper wire, the field coils then soaked in thick shellac, hung to dry, and then baked in an oven for about 12 hours. This removed all volatiles from the shellac and created a flameproof coating as stable as Formvar is, today. So the simple act of overheating these old motors, alone, will not usually cause them to start a fire. It will, over many years, allow the shellac to crack. When that happens, the turns of the coils start to loosen from each other and the motor may hum a little. It is this weakness then that opens the door for catastrophic failure at some point, if the motor is over-oiled or a field connection partially opens. When field coil windings vibrate, they attract air, which invariably contains dust and oil, molds, etc. This sets up shop in-between the windings and the field laminations and continues the degradation, although very little, by comparison. So when the motor is started again after 30-50 years of collecting dust, it seems just fine. Depending on its previous environment however, as well as how much it was operated determines the degree of degradation of its components due to extra heat, dried oil, and vibration. The armatures in split phase motors are fairly impervious to damage, except for the centrifugal switch at one end, which you have seen. This switch is mounted on the armature and contacts the slip ring connecting the start winding to the ac line. The switch is sprung with light springs against the rotary contacts on the shell. When the switch is spun, its weighted contacts fly out, away from the slip rings. When that happens, even in a new motor, you can observe a blue flash inside the motor shell. That is caused by the back emf of the start winding. I shall repeat this for emphasis: If, over the years, those slip ring connections are varnished too heavily they become resistive and the power of the spark becomes much hotter when the switch opens. That is still no problem if the interior of the motor is reasonably clean. But if there is both varnish and layered dirty oil, they become a fire hazard. The real problem with these motors is over-oiling. They have usually two oil wicks on each end of the motor with an access screw, top and bottom. Two things can happen. The motor can be oiled before it has been disassembled and cleaned up, first. This allows new oil to soften the old oil and the resulting sludge will flow more easily under high temperature conditions. Normally, oil flows away from anything that's spinning, so it's still usually OK, but not always. When the piano plays a few short rolls and then stops, the resurrected sludge finds its way around the centrifugal switch. The ensuing plays then create a heavy varnish. Pretty soon the motor begins to stink when it plays. That's caused by oil having been thrown around inside the case of the motor and then smoking. When that happens, some owners feel obliged to fix it by spraying the insides of the motor through the shell holes with WD-40. They really give it a washing, too. Trouble with that idea is, it makes the problem ten times worse. The second idea is to relube the front bearing wicks only, because the rear is impossible to reach, mounted in a grand piano at least, so they put twice as much lube in front to make up for the one they couldn't reach in back. Then they use the screw cap cover as a "piston," to force their fresh oil through the felt wick packing and into the bushing. The bushings were made with holes or slots to permit oil travel. Those slots are usually filled up with gunk and are no longer empty slots, so the new oil has to go somewhere and it gets slung around the slip ring contacts of the start winding. Given the right moment in history and some fresh oil, 99% of the time, if a motor starts a fire, it starts at turn-on. You will usually hear a hollow-sounding pop. That's the start winding flash as the switch opens for the run winding. When that happens, there is a blue flash and then bright orange flames. It will burn through the soundboard on a grand very quickly, then the rest of the house is next. As far as the motor starting a fire from steady operation is concerned, this is pretty unlikely. The reason is, the oil's flash point is considerably higher than its smoke point, but is probably somewhere in the vicinity of 425-475 F. It's very unlikely that any electric motor would normally get that hot, unless it has a partially shorted turn, in which case under normal (dry) circumstances it would still run safely unless there's too much oil tossed around inside the case. 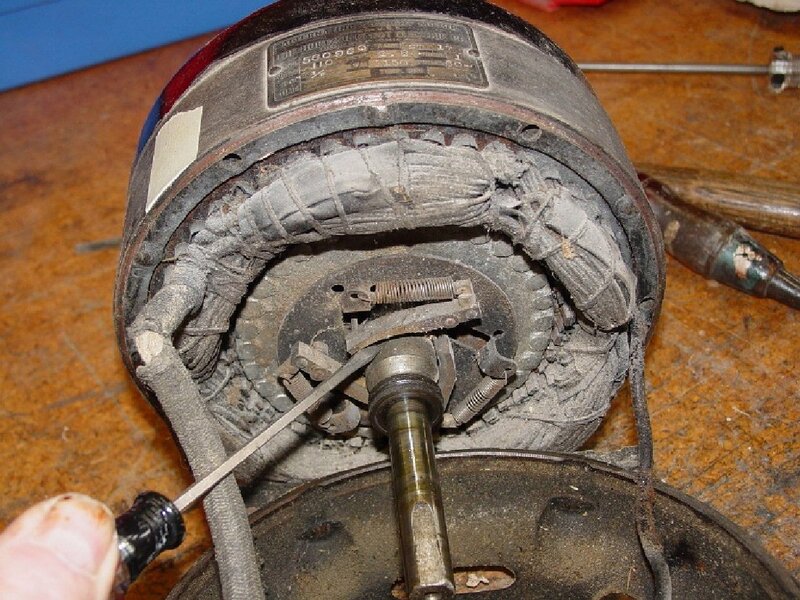 The best rule of thumb however is to have the motor removed, disassembled, and inspected if you ever smell smoke or the motor just smells "hot," and don't use it until that is taken care of to everybody's satisfaction. 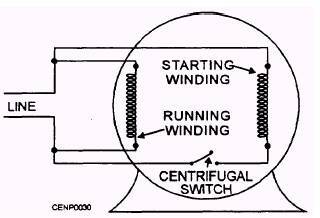 When a rewinding is called for, it's very important to rewind the run field winding with larger gauge wider than was originally used, because you can, and this causes the motor to operate at perhaps 50 degrees cooler temperature. It also increases its power factor by about 70%. The room in the case allows this simply because Formvar coated copper wire (demand copper) takes up less room than the same number of turns of cotton-covered, shellacked coils did. The motor rewinding shop should be easily able to figure this out for you. I have a formula for it, but not having used it myself, won't publish it here. There's really no problem. All they have to do is count the turns in the run coils, measure the diameter of the original wire, and replace those exact same number of turns (both start and run) with identical DIAMETER new wire. That increases it by about 30 circular mils. Be sure and put that down in writing on the work order, though, and have it acknowledged by the shop office. I have found that motor shops tend to do things without thinking. There is another trick which can nearly double the power of that motor, and used in Ampico concert grands to drive the pump at double speed or more in order to achieve 90 inches or over spill pressure on amplified position in the model A-which is what all concert grands were provided. The original concert Ampicos all had two electric motors and 2-1/2" diameter motor pulleys sheaved together to do this. 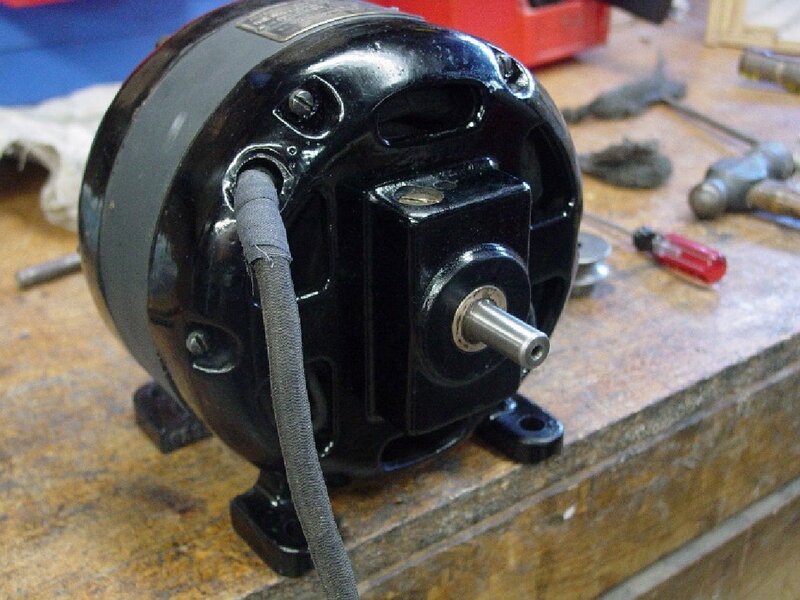 To nearly double the power of one of these motors, calculate the increase of the diameter of the wire after cutting the number of turns of the field coils by 30%. (Or in other words, having only 70% of the number of turns in each coil.) That effectively doubles the power, or provides enough torque to reach 90 inches of H2O vacuum on "Brilliant" setting, given everything else is tight and new. By increasing the circular mils of the wire used to fill the space between coils, you also improve the power factor of the motor at the same time, and the motor runs cool, even when swinging the pump at over twice the rpm. It's very important to clean out the bearings and repack with the right weight oil before reassembling the motor. Also the start switch must likewise be cleaned up and polished. Leaving wire brush marks or carborundum paper scratches on the copper contacts without re-polishing them first just invites a quick re-varnishing and hot sparking later on. A good motor shop understands these details, but sloppy workmen don't bother with details. In short, these old motors, although typically running hot after an hour or so are safe, with the exceptions referred to, above. 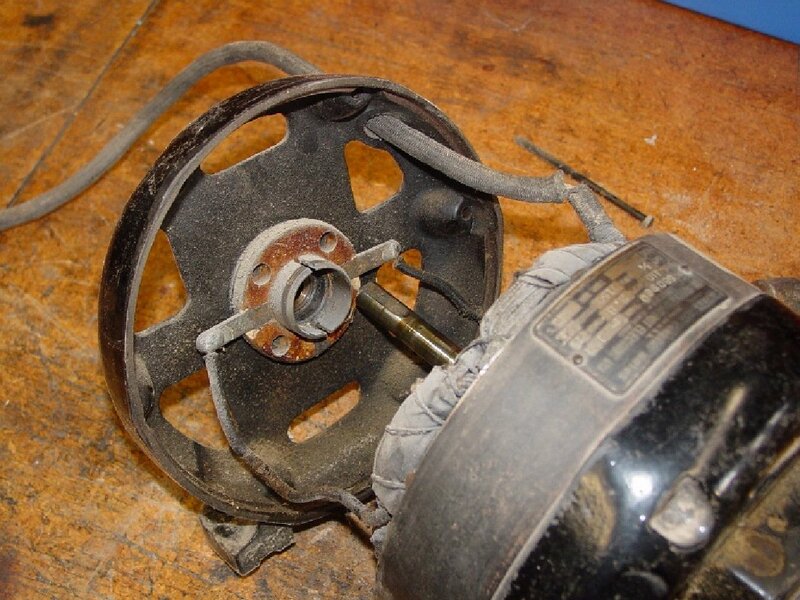 When re-oiling for the first time, they should be taken apart and cleaned up first, inspected, the start switch cleaned up and internal motor connections (under the tape) checked generally to make sure you don't find burned or scorched areas around them which would indicate a loose connection. Tip: make a punch mark or scratch on the case halves to get it back together right. The wicks which are wool yarn, which oil the bushings can be repacked if determined they need to be. Otherwise, the bushings should be oiled directly with a few drops before reassembly, and then the wicks should be re-saturated with SAE 20 oil after reassembly. Overall then, the interior of the motor should be clean and dry. If you see evidence of over oiling, scrub the inside of the motor with naphtha and a brush and let it dry overnight. Mainly, just use some good sense, and that motor, in its original state, all nice and clean will perform forever. I want to stress that danger of fire is very small, unless the motor has been improperly serviced. A dry, dirty motor is not the same as an oily dirty motor. But if the motor seems to be making clicking sounds, especially during loud passages of the music in the case of a reproducing piano, it would be wise to turn it off and disconnect it immediately, then have the motor completely serviced by someone who understands them. That usually requires a complete repacking of both bushings, as well. 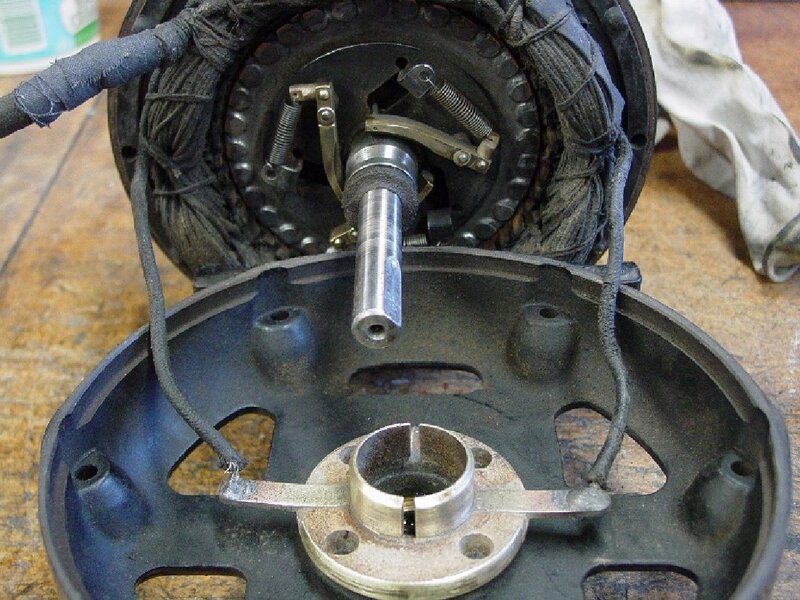 It is also best to repack the bushings only after the armature has been reinserted, to prevent felt hairs from wedging between the bushings and the motor shaft and binding it up.